Our Neem*Enamelizer ToothPaste keeps your salvia levels balanced and alkaline, ensuring that tooth enamel stays healthily mineralized. This alkalinizing polish combines cinnamon, coconut oil, saponified olive oil, neem, and sodium bicarbonate. Squeeze a tiny pearl of Neem*Enamelizer ToothPaste onto a dry toothbrush for fortifying results. 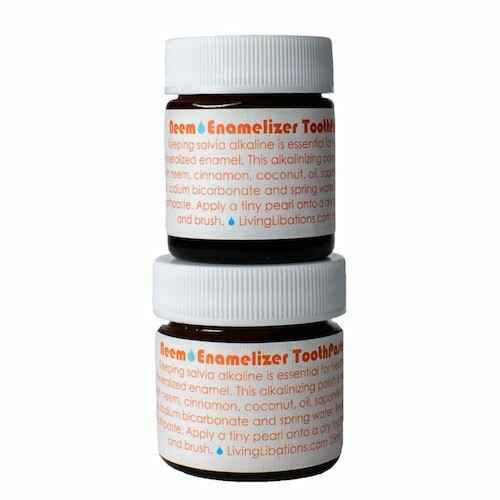 Neem Enamelizer will leave your teeth feeling silky smooth. Our organic, wild-crafted toothpaste helps your saliva absorb the enzymes and nutrients that re-mineralize tooth enamel. All-natural alkalinizing ingredients include cinnamon, coconut oil, neem, saponifed olive oil and baking soda. Just a tiny drop added to a dry toothbrush packs enough power for an entire brushing session. Saliva contains many chemicals and enzymes that exist specifically to take care of the teeth. It’s designed to bathe teeth throughout the day in a solution that has a pH of approximately 7. This is exactly what your teeth and gums need. Saliva can re-mineralize or de-mineralize teeth. It controls bacterial flora in the mouth, prepares food for digestion, and produces vital hormones. In Sanskrit, the word for neem is ‘arista,’ which translates to “perfect, complete, and imperishable.” Neem has been used for thousands of years in Ayurvedic practices, especially in traditions concerning agriculture, food storage, and medicine. Many research studies have proven the fungicidal, miticidal, and antibacterial properties of neem. Neem oil is an ideal remedy for eliminating periodontal and tooth infections. It can be applied locally around the teeth and gums, and is also beneficial for the gastrointestinal tract. Extra virgin coconut oil is an antibacterial wonder. Containing seven different naturally occurring acids, coconut oil prevents tooth decay by reducing harmful bacteria in the mouth. Candida albicans, a fungus that causes oral infections, is no match for the antifungal powers of coconut oil. Researchers at Ireland’s Athlone Institute of Technology have even called it “the healthiest oil on earth.” Super-ingredients in this oil include Caprylic acid, Capric acid, Lauric acid, Myristic acid, Palmitic acid, Stearic acid, and Oleic acid.